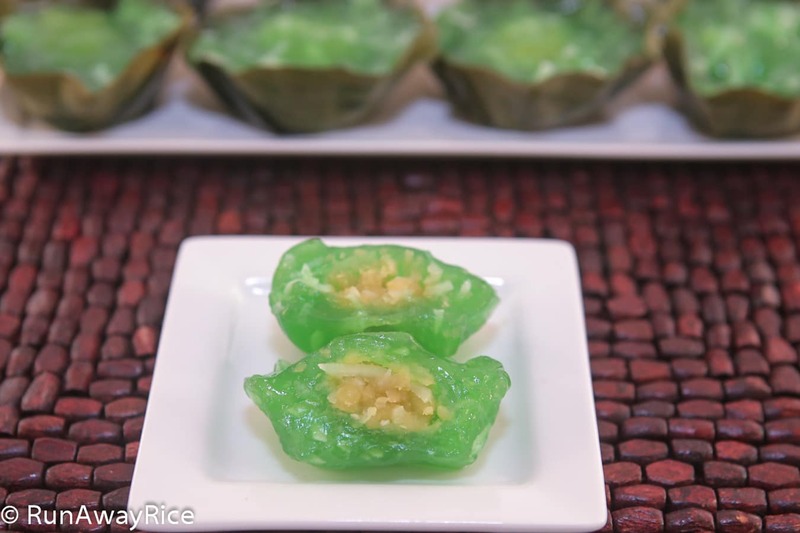 The typical method of making the Tapioca and Mung Bean Cake is to roll individual cakes in plastic wrap and then steam. I am not entirely convinced that steaming food in plastic wrap is safe and so I’ve revamped the preparation. I use silicone baking cups lined with banana leaves. The banana leaves add lovely aroma and make cleaning the baking cups much easier. Tapioca starch is quite gluey and sticks to everything! If you don’t have banana leaves handy, use foil baking cups. I buy banana leaves in the freezer section of my Asian grocery store. To defrost, simply run the leaf under warm water. Then clean the banana leaves and cut to the needed size. For any remaining leaves, I place in a resealable plastic bag and pop it back in the freezer. Place a banana leaf square on top of the baking cup and gently press the leaf inside the cup. Flip the cup over and trim the excess leaf with scissors. Continue lining all cups. Brush the banana leaves with the vegetable oil. In a small bowl, combine all ingredients for the filling. Mix until a soft paste forms. In a medium saucepan, add the tapioca starch, sugar, water, vegetable oil and Pandan paste. Whisk until the tapioca starch and sugar are dissolved and the mixture is smooth. Place the saucepan over Low heat and stir continuously. In 2-3 minutes, the mixture starts to thicken. Turn off the heat but continue stirring as sauce thickens and becomes a soft dough. When the dough starts pulling away from the saucepan, remove from the heat. Add the coconut flakes and stir quickly, blending well. Spoon a tablespoonful of dough into the cup. Add a teaspoon of filling in the center. Add another spoonful of dough on top. Spread the dough evenly in the cup. Continue with these steps making the remaining cakes. Steam the cakes for 15 minutes over Medium High heat. Remove from the steamer and allow to cool for at least one hour before serving. To serve, peel off the banana leaf (and discard) and enjoy the Tapioca and Mung Bean Cake as finger snacks. Tapioca and Mung Bean Cake can be refrigerated for up to a week. Warm in the microwave for 10-15 seconds before eating. They can also be frozen for up to 3 months. Cn I stem these in the oven by placing a casserole dish water on the other rack? Unless your oven has a steam function, these cakes will be baked rather than steamed and won’t taste right. If you don’t have a steamer, a big pot or wok with a steam rack works well too. Good Luck! Hi sis, the banana leaf adds a lovely aroma. A good substitute is coconut leaf but you can skip the leaves entirely for simplicity. Enjoy the recipe! Hi Nina, yes you can make the night before and refrigerate. Before serving, let the cakes warm to room temperature or simply pop in the microwave for 15-20 seconds to take-off the chill. Good Luck! Hi sis, sis mua may cai chen nho de lam banh su xe o dau vay ?